Sharpen blades like a professional with the Diamond Sharp Stick from Lansky. The 13-inch sharpener features a fine diamond grit surface bonded to a heavy-duty steel rod, offering impressive ability to maintain a sharp edge on everything--from your best kitchen cutlery to your favorite tactical knife. The over-molded rubber handle delivers a slip-free hold and user comfort. 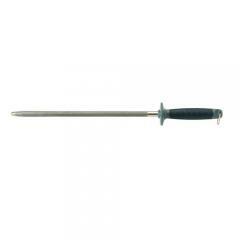 The classic Butcher Rod style design features a hand guard preventing injury during use. Keep blades in their original, factory-sharp condition with Lansky's Diamond Stick.